The Lifesigns project has been underway since about 2005. Originally keyboard player John Young wrote the music and enlisted Steve, a friend for a number of years, to produce. Bass player Nick Beggs (Kajagoogoo, Iona, Steven Wilson Band ) and then drummer Martin (Frosty) Beedle (ex Cutting Crew) became part of the band, which started recording at Liscombe in late Summer 2010. Lifesigns is the band’s highly anticipated self-titled debut album, a project that has turned out to be one of the finest new Progressive Rock albums of 2013. Featuring John Young (keyboards, lead vocals), Nick Beggs (bass, stick and backing vocals) and Frosty Beedle (drums), with Steve Rispin behind the mixing desk, the material reflects the wide experience and excellence of the musicians who perform on the album. This impressive line-up is augmented by guest appearances from such respected figures in progressive music as Steve Hackett (Genesis), Thijs Van Leer, (Focus), Jakko Jakzyck (King Crimson) and Robin Boult (Howard Jones, Fish ). Produced by John Young and Steve Rispin, Lifesigns is a tuneful, innovative and hugely impressive debut album certain to appeal to those who appreciate the finer aspects of modern progressive Rock. It’s available to buy here. The Lifesigns live band has begun what hopefully will be an intensive programme of live gigs, starting in the UK and Holland. 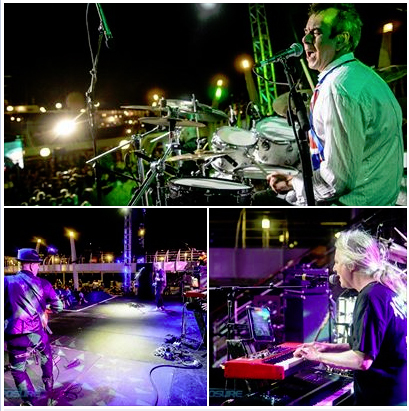 One highlight was the 2014 Cruise to the Edge voyage to Cozumel in April, with major artists like Yes, Marillion and Steve Hackett topping the bill. Lifesigns won acclaim from the many fans on the cruise. 2015 is a big year for Lifesigns, with a full length concert DVD, appearances at the Marillion convention in Holland, and Cruise to the Edge once again in November, and the beginnings of a second CD all on the agenda.